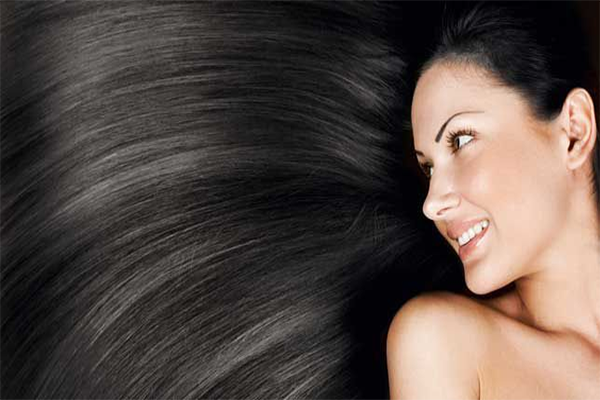 How Ayurveda Can Help To Get Healthy Hair? In this shloka, the qualities of Pitta dosha are explained. Meaning: Sasneha: slightly oily, Teekshana: piercing, Ushna: hotness, Laghu: lightness, Visram: bad smell, Sara: having fluidity and movement and Dravam: liquidity. Ayurvedic researchers believe that approx 50% of women are losing their hair faster. Hairs are delicate, so should be handled with care. Hair loss is termed as baldness or alopecia, which refers to as the loss of hair from any part of the body or head, mainly the head is involved. It varies from a small area to the entire body. Hair grows every part of the skin except the palms and soles of feet. Hair is made up of keratin (which is a protein) that is produced in the hair follicles in the outer layer of the skin. 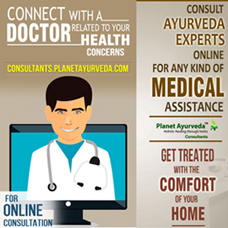 In Ayurveda, it is correlated with “khalitya”. It is a tridoshaja vyadhi i.e., it is caused due to vitiation of Vata, Pitta and Kapha dosha along with rakta dosha. In this condition, the main cause is the bhrajaka pitta (a type of pitta dosha) which sites in the skin and roma Kupa (opening of a hair follicle) gets vitiated and enters in the skin through these hair follicles with the help of vitiated Vata dosha due to which hair started falling. Along with this, the vitiated Kapha and rakta dosha block the opening of hair follicles that stops the production of new hair. Hair loss mainly occurs when the hair growth cycle is disrupted or when the hair follicle is destroyed and gets replaced with scar tissue. The main cause of hair loss is hereditary and it gradually occurs with aging and in predictable patterns i.e., bald spots in men and receding hairline. Hormonal changes can cause temporary or permanent hair loss which includes hormonal changes during pregnancy, menopause, childbirth and thyroid problems. Some medical conditions such as alopecia areata cause patchy hair loss and scalp related infections such as ringworm. There is a general thinning of hair after a stressful physical and emotional work. This type of hair loss is usually temporary. The hair may not grow as same as they were before. It is a condition which occurs genetically and can affect both men and women. It is characterized by the gradual disappearance of hair from the frontal scalp in men and in women there is a general thinning over the scalp and hair loss at the crown. In this condition, there is a permanent loss of hair with several skin disorders such as lichen planus which results in scars that destroy the ability of the hair to regenerate. It is a natural condition in which the hair gradually becomes thin with age and the remaining hair become shorter and are fewer in number. In this condition, the hair follicles go into the resting phase. This condition causes the body hair to fall out from the various body parts including eyelashes, eyebrows and pubic hair. This condition started suddenly which causes patchy hair loss in children and adults which may result in complete baldness but the hair returns within a few years. This type of hair loss mainly affects the scalp but it may also occur in eyebrows or beards. A person may feel itching or pain before the hair falls out. An emotional shock can cause the hair to loosen. This usually causes overall hair thinning. It is the most common type of hair loss which affects both men as well as women. It is most commonly caused by ringworm and is accompanied by redness, broken hair and swelling. This ayurvedic formulation is formulated to take care of all the hair related problems. This is an amazing combination of several herbs such as bhringraj (Eclipta alba), haritaki (Terminalia chebula), Amalaki (Emblica officinalis), bibhitaki(Terminalia bellerica) and Brahmi (Bacopa monnieri). It is beneficial for both males as well as females. This hair oil protects the scalp from dandruff and prevents the hair from fungal infections. It also provides nourishment to hair and clears the toxins. It is a 100% natural formulation that works on hair without disturbing the body’s hormonal system. Go richh hair shampoo is an effective herbal formulation that cleans the scalp by removing the toxins from it. This oil gives life to dull hair. It has no harmful chemicals and free from fillers, colors and prevents the hair loss. Method of Application/Usage: Apply appropriate quantity of this shampoo to wet hair and scalp. Massage in circular motion and rinse well. Go rich hair conditioner provides smooth sheen to hair by giving it healthy appearance. It works more efficiently if it is used after the go richh hair shampoo. How to use: After shampooing, gently apply along the length of wet hair from base to tip and leave it for few minutes. Rinse thoroughly. 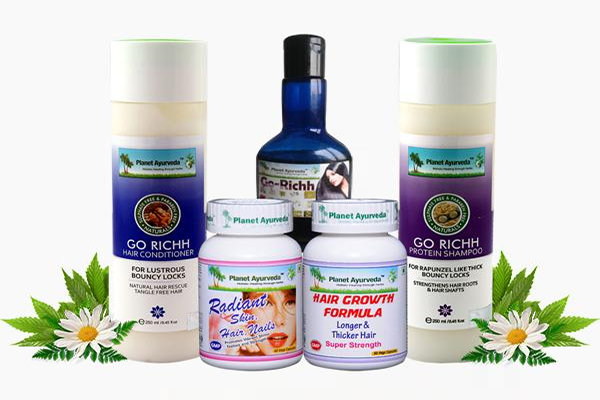 Hair growth formula is an effective herbal formulation which is a perfect blend of herbs like bhringraj (Eclipta alba), Brahmi (Bacopa monnieri), bhumiamalaki (Phyllanthus niruri), ashwagandha (Withania somnifera) and yashtimadhu (Glycyrrhiza glabra). It is formulated with the natural and effective herbs which give results in premature graying of hair, hair loss, and baldness. These capsules improve the strength of hairs and maintain the health of the scalp. It works by penetrating deep into the scalp and regenerates the new hair. Radiant skin hair nail formula is the most effective herbal formulation and is a perfect blend of herbs like Pitt papda (Fumaria officinalis), ghrit kumari (Aloe barbadensis), chirata (Swertia chiretta) and manjistha (Rubia cordifolia). Herbs used in this formulation prevent hair loss and provide beautiful hair with nails and skin. These capsules provide nourishment to hair from the root levels and repair the damaged as well as broken hair. When it is used regularly, it removes dust, dandruff and other impurities from the scalp and makes the hair even more strong. Herbs used in these capsules have a cooling effect which alleviates pitta dosha (main heating factor) in the body because it is the root cause for all the problems.